In book three of the Curse Workers series, “the perfect end to this gem of a trilogy” (Kirkus Reviews, starred review), trust is a priceless commodity and the lines between right and wrong become dangerously blurred. Cassel Sharpe knows he’s been used as an assassin, but he’s trying to put all that behind him. He’s trying to be good, even though he grew up in a family of con artists and cheating comes as easily as breathing to him. He’s trying to do the right thing. And he’s trying to convince himself that working for the government is the right choice, even though he’s been raised to believe they are the enemy of all curse workers. But with a mother on the lam, the girl he loves about to take her place in the Mob, and all new secrets coming to light, what’s right and what’s wrong become increasingly hard to tell apart. When the Feds ask him to do the one thing he said he would never do again, he starts to wonder if they really are the good guys, or if it’s all a con. And if it is, Cassel may have to make his biggest gamble yet—on love. 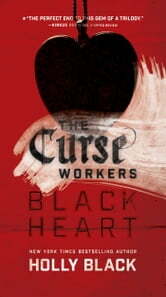 Love is dangerous and trust is priceless in Holly Black’s “powerful, edgy, dark” fantasy series (Publishers Weekly). Is super amazing love it!!! !